The Smart 4000 series Interactive touch screens are the latest product from Smart board it incorporates a large format 65" commercial LED touch screen with Smart Notebook software. The 4000 series has been designed specifically for classrooms and is a fantastic alternative to the traditional interactive whiteboard and projector. The touch screens provides 50,000 hours of usage double the life when compared to standard commercial screens. The 4065 Boasts a full 1080p high-definition, shadow-free LED display screen which features low-friction coated glass, this enables fingers to glide smoothly over the entire surface, this facilitates a natural touch experience. 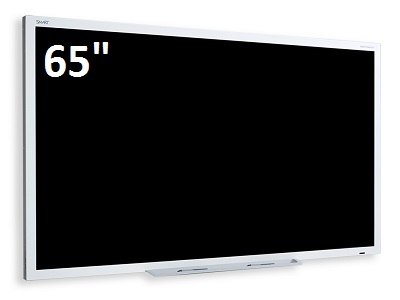 The SMART Board 4065 interactive screen virtually eliminates all glare and provides a picture perfect view from any angle this ensures that everyone in the classroom will have a clear view. The 4 point multitouch SMART Board 4065 interactive flat panel features freestyle multi-user interaction anywhere on the display with Windows® 7 or Windows 8 operating systems, enabling multiple students to collaborate on the screen without limitations. The 4000 series delivers an unparalleled viewing and writing experience this coupled with the ever popular Smartboard software makes a natural upgrade for any classroom and with one of the best value 65" touch screens available on the market today.